OTHER: 2011 - The Year of the Word. We live in a time when all history and culture has been placed online at our fingertips. It takes no effort, time or cash for everyone to be inspired by everything everywhere past or present. We as a society now digest popular culture just as a newborn baby digests the world around it; we constantly flick from one fascinating object to the next, without considering which one may be worthy of our attention. Coincidentally (or not?) the previous decade was a time when popular music failed to focus on one common movement, a defined fellowship of musical styles. Where once we had Rock ‘n’ Roll, Glam Rock, Disco, New Romantics, Hip hop, Rave or Britpop, we’re now faced with all-​​encompassing genres whose influences and inspirations bleed into themselves. Has the way we listen and learn affected the music being made? 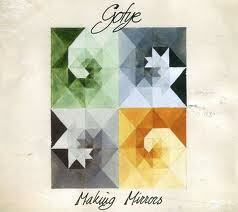 It’s with this in mind that the music of Gotye must be framed. ‘Making Mirrors’, the second album proper from Belgian born, Aussie raised producer/​singer/​songwriter, is immediately striking for its breadth of influence and scale of ambition. The sounds on ‘Making Mirrors’ seem painstakingly haphazard, born from sampling records from charity shop bargain bins and experimenting with a wide array of instruments and effects, from a musical fence to a discarded organ. But as songs, these sounds suddenly seem strikingly clear and deliberate, and they work. State of the Art, the album’s best track, is SO good that it warrants a whole separate discussion here. ‘Easy Way Out’ is a sublime 118 seconds of clattering percussion and tawdry guitar, with a great video. ‘Don’t Worry, We’ll Be Watching You’ would be nothing if the haunting lyrics, eerie beats and sinister vocal didn’t fit so perfectly. ‘Smoke and Mirrors’ intrepidly sneaks past, fuelling our paranoia whilst ‘Eyes Wide Open’ carves open the stark dark truth of our planets impending doom using the aforementioned fence, a galloping drum and a sinister steel guitar as musical accompaniment. It’s music to get lost in. For a long time. How quickly these sounds become songs will depend on the listeners musical diet, with one obvious exception. ‘Somebody That I Used To Know’ tiptoes over a Luiz Bonfa guitar sample, whilst a quietly militant rhythm and droplets of synth pierce the fraught lyrical sentiments with scattered sound. But in this instance the sounds are not the reason it works. It works because the song itself, a familiar tale of bitter heartache set to beautifully begging melodies, is so impeccable even 5 musicians playing one guitar can make it work. Serveral other tracks (I Feel Better, In Your Light) strive to succeed on the same merits with differing levels of success. Coupled with the broad musical palette, on first listen this leaves a fractured album of part-​​Sound part-​​Songs that may not be the cohesive piece some listeners are expecting. It takes time for the subtleties to shine through, and herein lies the problem. In a world that lacks focus, will we notice the details? So to my primary question; Has the way we listen affected the music being made? Yes. Have we noticed? No, because we, the mass audience, have also changed the way we listen. We listen to more music fewer times, skimming the surface rather than diving in. So to criticise ‘Making Mirrors’ for “lacking focus” (as some critics have) is to criticise pop and its audience for the same crime – and neither are worse off for it. By (inadvertently) holding up a mirror to his audience, Gotye exposes this lack of focus as one of his and our strengths. 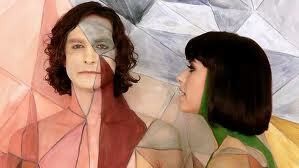 This may be the most commercial album Gotye ever makes, but it will not be his best. He and we are newborn babies in this new world of infinite choice. Our current lack of focus is our innate strength, the very trait that will enable us to learn and prosper. But soon we’ll grow up, we’ll re-​​learn in entirely new ways how to value and reinterpret the art that deserves our attention, and new artistic movements will rival those of days passed. Or at least, they will if we let them. Please focus.